Many Ni-Vanuatuans (meaning ‘of Vanuatu’) live a traditional life, upholding customs that have been passed down through generations. It’s a very respectful culture, characterized by a constant cycle of rituals and customs, with extended families travelling many miles to join in the celebrations. Elders are held in high esteem, with a Chief appointed to oversee village life. Pigs, yams and kava are paramount to village economies and are intricately connected to rituals. With no written language, storytelling, dance and songs are used to communicate history. Walking is a way of life through these mountainous islands, with paths that link villages often penetrable only by a strong man wielding a jungle taming machete. Want to know more? Read on for our Vanuatu Cruising Guide! Yachting World Marina and Moorings have been welcoming sailors to Port Vila for 25 years. Anchoring is somewhat of a problem in the harbour, with the anchorage behind Iririki Island often crowded. The harbor itself is mostly either too deep or too shallow. The best option is to rent a mooring or a ‘stern to’ berth. It also means you’ll have access to their onshore facilities like fresh water, showers and a laundry. Port Vila is the base for most charter operators, though some vessels also operate out of Port Havannah to the north. The main advantage of departing from Port Havannah is the close proximity of good cruising, diving and snorkeling sites around Hat, Lelepa and Moso Islands. The islands of Vanuatu are grouped roughly into three groups, with the Torres and Banks Island groups in the north. Hayter Bay on Tegua Island is the best anchorage in this remote group. Upon approach, when villagers see your vessel, they will paddle out to your vessel, intent on trading food and handcrafts. The Shepherd Islands in the middle form a chain and include the largest islands of Malakula and Espiritu Santo, with Efate (and the capital Port Vila) the southernmost island. Port Stanley on the east coast of Malakula has plenty of anchorages offering good protection from south easterlies. Also on Malakula, Lambumbubu Bay is a copra pick up point, but is otherwise pretty quiet. It’s one of the few anchorages where vessels can penetrate relatively deep into a bay. In the southern group is the popular island of Tanna, known for its active Mount Yasur volcano, but probably lesser known for a traditional three day gift exchanging ceremony where up to 2000 villagers attempt to outdo each other with elaborate gifts. Port Resolution is one of the few anchorages on Tanna Island. The village owned Port Resolution Yacht Club is located on the East Point overlooking the bay and can help with provisioning. Vanuatu’s superb cruising grounds attract many ‘lifestyle cruisers’, those enviable yachties who cruise long term. For visitors who arrive by air anticipating to ‘self skipper’, there are limited opportunities, with most charter operators offering fully crewed, scheduled tours. • Paradise Adventures – Horizon 40ft motor cruiser for liveaboard game fish charters as well as tall ship sailing and expedition cruises at various times throughout the year. The wet season, from November through to April, is when you can expect heat, humidity and frequent rain. It’s also the cyclone season, with few safe harbours offering protection for mariners. According to South Pacific Organizer Vanuatu is the most hurricane prone country in the South Pacific, with 29 hurricanes striking Vanuatu between 1970 and 1985. For mariners, (particularly sailors) the best time to visit is between May and October. Though the south east trades blow year round, they are generally stronger and more reliable during this time. During World War II the islands of Efate and Espiritu Santo were used as military bases for allied troops, with subsequent war wrecks now creating fascinating dive sites. 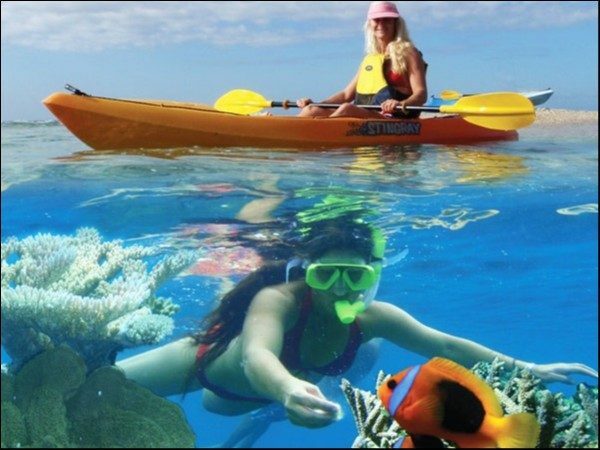 The SS President Coolidge and Million Dollar Point, where military equipment was simply bulldozed into the sea when peace was declared, are popular sites, with stunning coral gardens accessible to snorkellers. Aore Island just off Luganville houses a working cattle and coconut plantation as well as a boutique resort. But the real treasure is the natural aquarium just a few languid steps from the beach where coral bommies form their own private underwater ecosystems. Hideaway Island Marine Sanctuary has terrific snorkeling off the beach, as well as the world’s only Underwater Post Office. Located 3m below sea level and 50m from the beach, it’s manned by scuba trained Vanuatu Postal employees who share their office with colorful tropical fish and coral. Yachting World and South Seas Shipping in Port Vila are both valuable contacts for provisioning, fuel, LPG, sourcing spare parts or booking tours. There’s a fruit and vegetable market as well as supermarkets in Port Vila. Traveler’s intent on self catering in the outer islands should be aware that limited provisioning opportunities exist outside of Port Vila and Luganville, though most villages will have a market of sorts. Air Vanuatu and Virgin Australia have flights between Australian east coast cities and Port Vila. Customs clearance ports for mariners are at Port Vila, Luganville, Sola and Lenakel. Cruising Vanuatu for a comprehensive interactive guide to cruising Vanuatu. Use of aerial photography overlaid with chart cartography makes this a standout in the cruising guide market. Hi Fiona, just to update your cruising guide information, the Vanuatu Tourism Office and Department of Tourism have just released a comprehensive FREE Cruising Guide to Vanuatu, it can be downloaded from their website http://www.vanuatucruising.info or found on issuu.com or scripd.com. I bought that Vanuatu cruising guide a few years back. Its one of the best Ive ever used, much better than all the other guide books that get pretty worn out on our boat.